This is the final wrap-up post to celebrate the last Leisure Link. Today I feature all the bloggers who took the time to link-up for the last time! All in a Dad’s Work, with his post “We Hit the Trails.” Eric is a great dad who gives his boys Crash and Bang wonderful leisure experiences and tells about them in hilarious ways. Please check out his blog. The rest of the Leisure Linkers wrote about Halloween-themed hi-jinks, including recipes, fashion, costumes and leisurely experiences. Please take a moment and visit their blogs. Thank you to all who supported and participated in The Leisure Link over the past few months! How do you link to your leisure? Don’t you hate that? 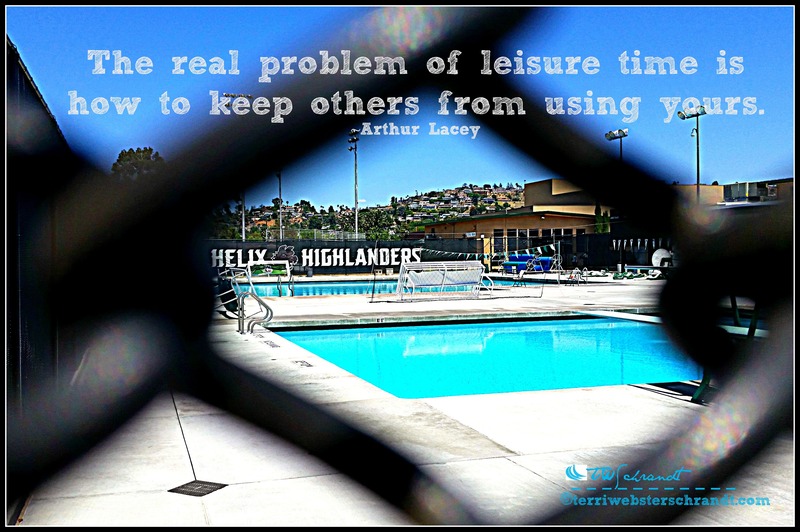 Don’t let anyone steal your leisure time! Guard it jealously. Speaking of links, have you heard of the website StumbleUpon? Janet Wald of Mostly Blogging, shared this post, “How to Dramatically Increase your Blog Traffic,” focusing on using Stumble Upon and Reddit. These sites can also be used for content curation and StumbleUpon is rather fun. UPDATE** If you want further information on adding a StumbleUpon button to your WordPress blog, check out Sue Coletta’s post: The Power of StumbleUpon: How to Add Sharing Button to WordPress dot com. For more information, check out my Pinterest Board Blog and Biz Resources for pinned articles about StumbleUpon. Linking to The Anxious Dragon Link-Up. Linking to your blog tomorrow. So you’re ending your linking party too, Terri. It’s my last Tip Tuesday as well, at least for now. I need the time for other projects, including visiting more people like you. I love stumbleupon. I need to follow you there. When you follow someone, it’s easier to “stumble” their posts. The more you stumble others, the more chances you have to get stumbled. Thank you for stopping by Tip Tuesday! It is so hard, Debbie, sometimes, because we want to do so much.I believe the Facebook group, Midlife bloggers association, is starting a stumble upon group. I will follow you! Have a great day! I agree with you, we need to guard our leisure time. It’s so rare in our hectic society, and we need to take precautions to ensure we don’t lose it entirely. Thanks for the comment, Aimee! Love that Richard, I hope to see that quote with one of your amazing photos soon!! I think I had read you were thinking of stopping your Linky Party due to lack of time. Is that what happened? Thank you so very much for linking to me and the mention. I hope all your readers come to our StumbleUpon group. We have many over there stumbling each other’s links. I’m sorry the linky didn’t work out for you. I shared your post on Twitter. Farewell Leisure Link! Thanks for the memories! Terri, thanks for your work as host of the Leisure Link, it was fun while it lasted and I’ve met some great new blogging friends. Happy Thursday! Happy Thursday to you, and thank YOU for your support! Thanks for the shout out, Terri! Thanks, also, for hosting Leisure links. It was fun to see how others used their leisure time. We don’t seem to get much of it these days! You did a fabulous job with this Terri. I’m impressed. Thanks for the mention, Terri. One question. Where did you get the StumbleUpon button from? I can’t find it as one of the WordPress sharing buttons. Thanks for sharing my posts there as well. I really appreciate it. Oh good for you! As I go through my emails of bloggers, I like, comment and stumble (Most of the time). I’m going to learn more about this! Have a wonderful day! You have to manually install it and get the image for the button from Google Images. Nice to see you here.